One of my goals this year was to go room by room in my house to make each space more organized and functional. I’ve been doing a lot of thinking and planning for rooms like my family room, master closet, office and a craft closet. But one of the rooms in my house has always been a bit more of a puzzle. It’s been “in process” for about three years or so. Because I’m slow like that. A couple of years ago I decided our “living room” really wasn’t working for us as a typical living room. I removed all of the furniture and started reimagining it as more of a useful “gathering area” since it was connected to our entry. I also wanted the living room space to be more useful to the small adjoining dining room. Sometimes we have larger groups in our home and it’s handy to have even a little a space to expand into when we need additional seating. I’ve been evolving my dining room into a brighter more casual eating space so of course, the evolution of that room impacts the living room. When your house is all connected it definitely requires a little more thought to the flow of the spaces. I thought about turning the living room into the dining room and even moved our table in there for awhile to test it out, but really didn’t like how it felt as a dining room with such a high ceiling. I didn’t want it to be a craft room or an office since it would likely always be a mess and no one wants to face that as they walk in the front door or down the stairs every morning. So, after considering the options we decided it needed to be treated just as a small sitting space between the entry and dining room. You might remember the progression of this room from the time we moved in until now. Here is how it looked when we bought the house (above) in all it’s “swine glory” prior to being painted. A few years ago we took a really big step (after painting it) and replaced the worn carpet (remember the paint incident?) with natural Hickory hardwood (from Lowe’s). 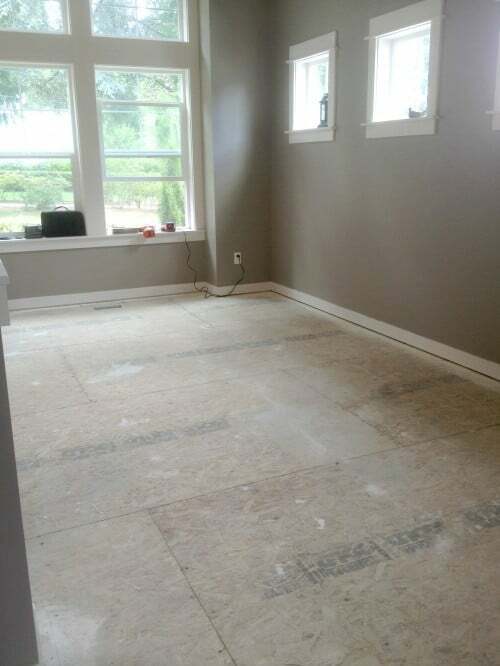 The wood flooring made a huge difference in how the whole house felt. The house definitely flows together better now and the hardwood is so much easier to take care of! One of the bummers about our house is that there is only one teeny tiny closet on the whole main floor (with the exception of the under the stairs pantry) and no built ins. While our kitchen and pantry have plenty of room for our day to day dishes and needs, I wanted additional storage in other rooms so every room is functional and useful. I dreamed of extra space for serving platters and pitchers, and books, of course. 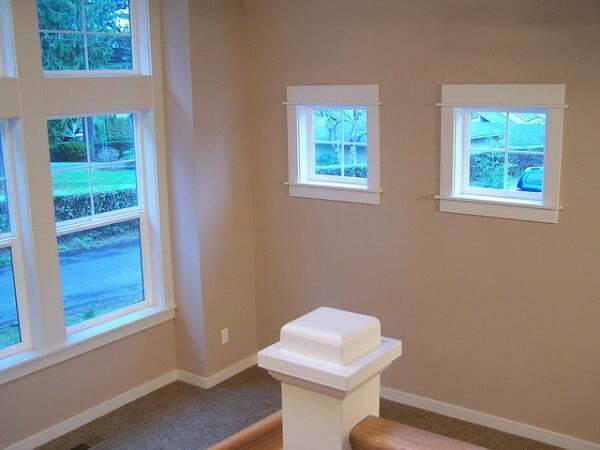 Rather than investing in a built-in for this room, I’ve been on the hunt for a cabinet that would be long and tall enough to not only make a statement on the wall below the small windows, but something that wasn’t too deep. The room is already narrow so I definitely had some size restrictions as far as what would look right in the room. 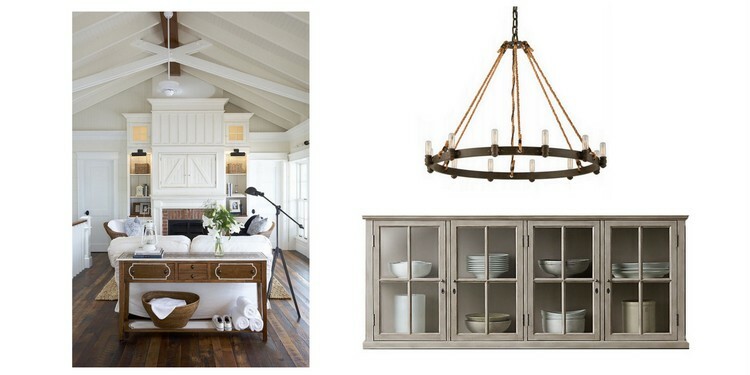 I finally found a cabinet at Restoration Hardware that is just what I was looking for — you can see it in the above photo, all Photoshopped in for our visualization! I had searched everywhere from flea markets to consignment shops and never found a cabinet I liked that was big or sturdy enough or the style I was looking for. I knew right away this one was perfect! And while I hardly ever buy larger pieces of new furniture, this was exactly what I needed so I took a deep breath and ordered it! I know I’ll be really happy with it. Now I can’t wait for it to arrive! I’m also still dreaming of a new white planked wall (I’m eventually planning to cover the “three window wall” with planks, leaving the rest of the living room/entry walls Studio Taupe), more white wood on the ceiling and adding a new light fixture (the style of the one from Barnlight Electric above is so lovely but I may also decide to just get a new ceiling fan — we’ll see). 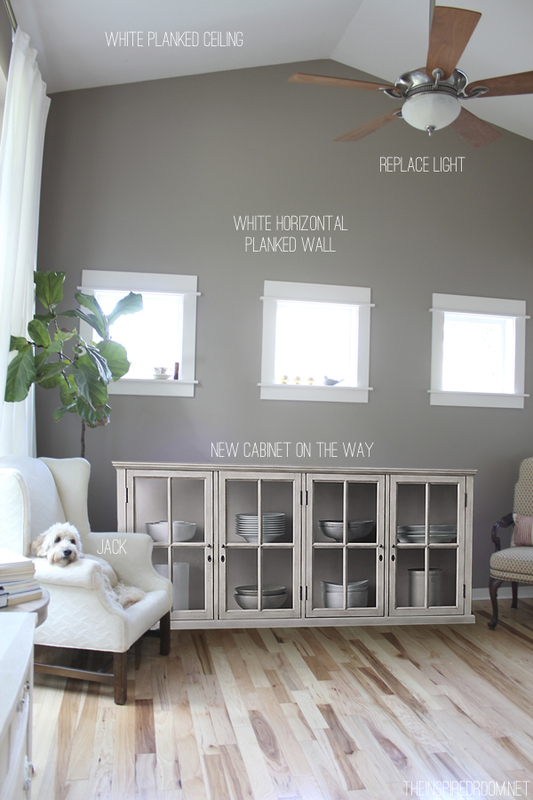 I’m counting down the days until the beautiful new cabinet arrives and hoping the plank walls might be next on my list. UPDATE: See how this space turned out here! 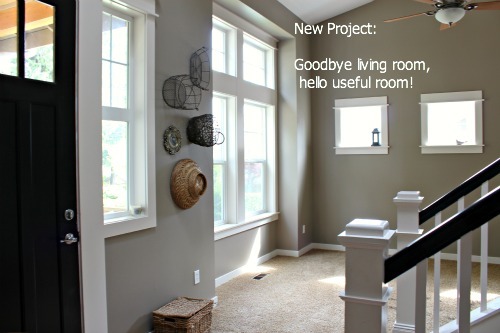 Do you repurpose or reimagine spaces in your home? Don’t forget that my Joss and Main sale ends on Tuesday the 22nd! There are some great pieces on there at amazing prices so don’t miss it! Sounds like a good plan. Looking forward to seeing what you do with the space. 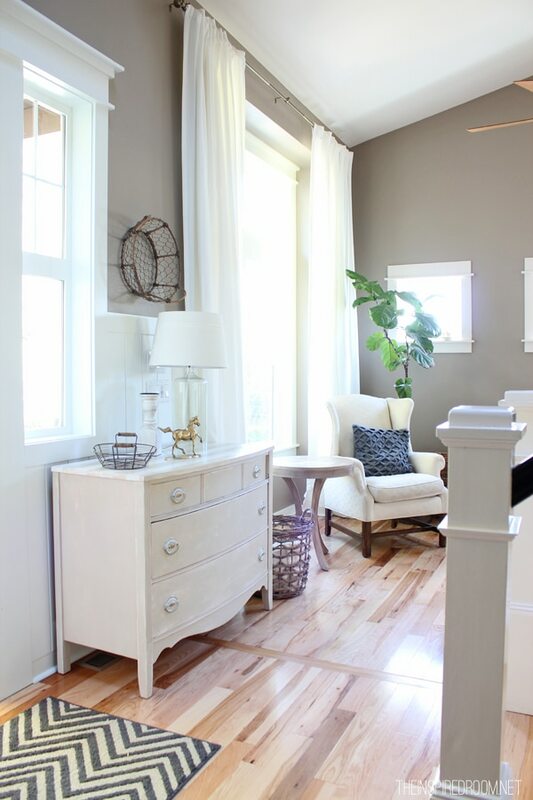 That inspiration photo from Muskoka Interiors is to-die-for gorgeous. I can’t wait to see how this room evolves. It’s going to look so pretty! I love the idea of the planked wall and ceiling. I debated planking my son’s wall all weekend. I want a planked wall, I just don’t want to plank the wall! Maybe in my next stage of decorating his room I’ll do that. I’ll just live vicariously through other bloggers for now. Can’t wait to see it! 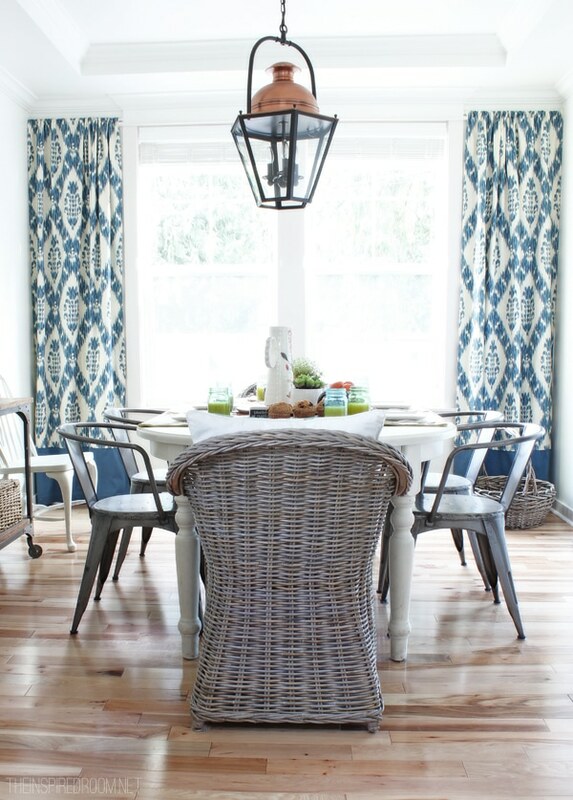 Your home is simply beautiful, and I love the ideas that you have for your gathering room. We have a ‘gathering room’ as well. It’s a unique space that I’m always trying to figure out. Thanks, these unique spaces are tricky but I’m hoping I can land on just the right idea to make it work for us! Happy Monday! Love this space and the new cabinet is going to be perfect. Can’t wait to see it all pulled together. Thanks, I’m getting excited about it! :-D Have a great day! I love the look of the new cabinet. Can I ask how the hickory hardwood is holding up with the dogs? Our red birch hardwoods (not chosen by us) are scratched and gouged to high heaven from our 60lb doodle and I’m dreaming of something more durable. Our floors are holding up well, considering all the pups we have running around all the time! :-) They do get scratched by the dogs, but it is just surface scratching as would happen with all real wood. We don’t have any gouges or denting, Hickory is a really hard wood. Our floors have so much character already that I don’t mind the wear and tear or really even notice the scratches unless I stop and think about it and look for them. Eventually it can be refinished if necessary too, so I’m happy with the floors! Thank you! I think hickory is the hardest recommended for flooring so if that doesn’t work nothing will! Once I win the lottery I think I’m going the hickory route everywhere :). I love the ideas you have. I am always so in love with your light wood floors. They are gorgeous. I am currently re working my study, off of the living room. I am also toying around with the idea of a wood plank wall. Not sure on color, part of me wants to go crazy and add different colored planks, but the other part wants to go simple and bright with one color. I usually change my mind ten times before I finally settle on something, and still end up revising it. love where you are going with this!! and is your Fiddle still holding on or is that a new one? I love the color that you painted the room. Would you mind sharing the color and brand you used??? I love how you have planned this space very carefully. I wish I could better visualize my space to maximize its potential. From what I see, your living area is no longer “lost”. It has a purpose and you’ve filled it with nice and large pieces of furniture. I’m currently struggling to stop fantasizing about spaces I see in magazines and on the internet and rather start focusing on how to bring some of those ideas into my own space. Thank you for the inspiration! I love how patient you’ve been in deciding what this room’s true purpose should be. I think your final choice is absolutely perfect and should be gorgeous. I have a similar wasted room that I’d love to repurpose and have been also playing with and discarding ideas. One day she’ll let me know what she wants to be. Can’t wait to see how yours comes out! Melissa this is so exciting!!! I love wooden ceilings and we are planning to do them in our new extension. Hi! My answer to your question is a big YES! We have moved furniture around our house for large events and have rearranged our living spaces to accommodate dining seating for up to 40 people in the past. It’s amazing what we can do with our homes if we think beyond the obvious. I really enjoyed this post. Thanks for sharing! Hi Melissa – I’ve followed along with your blog for a couple years now and LOVE it! Would you mind sharing with me where the white drapery panels are from that you’ve used in your Entry/Gathering Room? I am sure you’ve listed it somewhere and the answer might be even on this page, but I can’t seem to find it!